Black Ice Software - BiBatchConverter version 4.21 is released! Dozens of new supported file formats, major improvements in the PDF printing, text extraction and more! 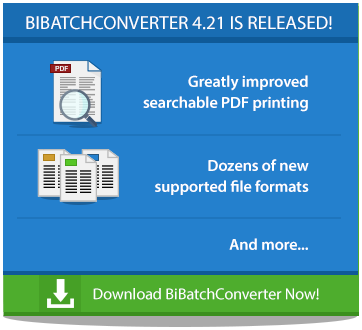 Black Ice Software has released the BiBatchConverter version 4.21 including dozens of new supported file formats. New version includes the followings: XLTX, XLTM, XLT Excel Workbooks, POT, POTX, POTM PowerPoint documents, DOTM Word document and MHT(MHTML) Web page archives. The new version of BiBatchConverter also includes greatly improved PDF printing. The improved PDF can generate searchable PDF, even if the source document uses glyph indexes instead of characters. Besides these new features, the BiBatchConverter includes several minor improvements and updated documentation to enhance the user's experience.